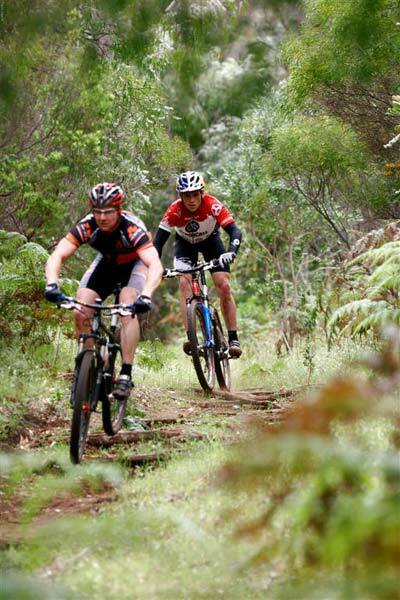 At Dunsborough Physiotherapy Centre we treat a wide range of injuries. 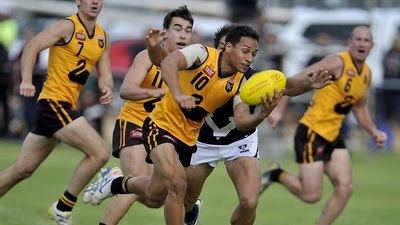 Our Dunsborough physiotherapists are able to provide effective evidence-based physio treatment and supply effective rehabilitation programs to get you "back on track" as quickly as possible, and to prevent re-injury. 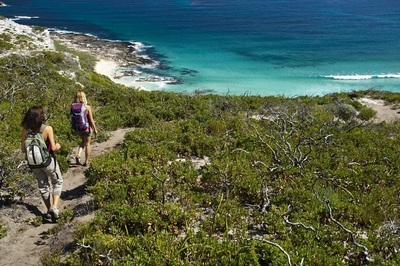 Below are some of the more common conditions we see at Dunsborough Physiotherapy Centre, and some basic information relating to each condition. If you are suffering from one of these conditions our team of physiotherapists at Dunsborough Physio Centre have the knowledge and the skills to help: phone 97553600 for an appointment. Low back pain: there are a number of causes of low back pain, including facet joint arthritis, disc damage (annular tear / bulge / prolapse), ligament and joint capsule sprain, muscle spasm / strain, spondylolisthesis, vertebral fractures, spinal stenosis, scoliosis, and nerve root / spinal cord compression. ﻿Common symptoms: ﻿ back and leg ache, numbness, tingling, burning or shooting pain in the lower limb (if there is nerve root involvement), stiffness and soreness in the morning (problems forward bending), increased pain with prolonged sitting, pain getting out of a chair / with prolonged standing. Risk factors: inflexibility, poor abdominal / gluteal tone, prolonged periods of sitting, repetitive lifting / sustained forward leaning, arthritis, poor posture, obesity, genetics (collagen deficiency). Disc injury: Intervertebral discs are rubbery pads between the vertebrae (back bones) of the spinal column. Each disc is a flat, circular capsule which has a tough, fibrous, outer membrane (the annulus fibrosus), and an elastic core (the nucleus pulposus). 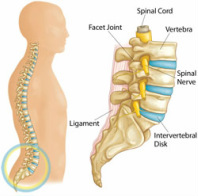 The discs are held in place by the ligaments connecting the spinal bones and the surrounding sheaths of muscle. By early adulthood, the blood supply to the disc has stopped, the soft inner material has begun to harden, and the disc is less elastic. By middle age, the discs are tough and quite unyielding, with the consistency of a piece of hard rubber. These changes make the disc more susceptible to injury. There are varying degrees of disc injury, from annular tearing of one or more of the tough fibrous outer "onion ring" layers, to extrusion and sequestration. Injuries can be classed as degenerative (gradual wear and tear), or acute. If the outer portion of the disc is injured (torn), all or part of the core material may protrude through the outer layers, pressing against surrounding nerves. If further activity or injury causes the membrane to rupture or tear, the disc material may further extrude, causing pressure on the spinal cord or the nerves that radiate from it. This may result in extreme pain, muscle spasm, and pain radiating into the lower limb. 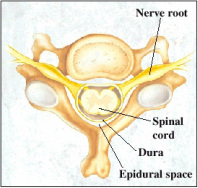 Herniated discs are most common in men and women ages 30 to 50. Older people, whose discs no longer have fluid cores, are much less likely to encounter the problem. Disc degeneration and dessication is a normal part of ageing. Degrees of degeneration vary greatly due to a number of factors including profession, hereditary factors, and general conditioning. Neck pain and headache: potentially originating from a number of structures (disc, facet joint, muscle, ligament, joint capsule, or nerve root) neck pain and associated headache can be very debilitating. There are a huge number of headache types. Physiotherapy intervention most often involves tension-type headaches and headaches caused by the temporomandibular (jaw on skull) joint. Common symptoms: headache (affecting the back of skull, forehead, temples, and behind the eyes), lack of movement (problems backing the car/ speaking to someone next to you), sharper pain with rapid movement, arm pain, pain inside of, or on top of the shoulder blade. Muscle strain (tear): muscle strains are graded depending on the amount of damage. Regardless of the degree, the principles of RICER (rest, ice, compression, elevation, and referral) apply to limit damage. Whether it be the hamstring (pictured), quadriceps, calf, or any other muscle group; early effective treatment for muscle strain is paramount to prevent poor healing / re-injury. Common symptoms: variable depending on the grade of injury. 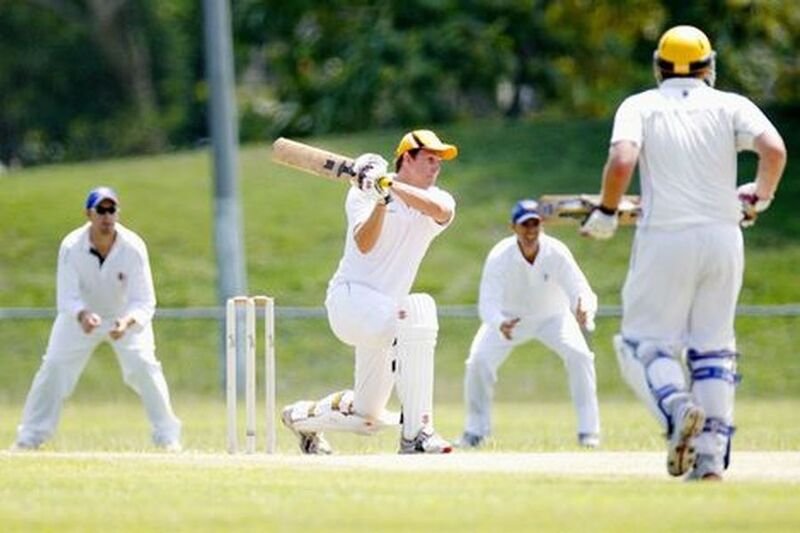 Grade 1 injuries are often not noted greatly during activity and only felt once cooled down, whereas grade 3 injuries (full tear) create great pain and the athlete can not continue on. 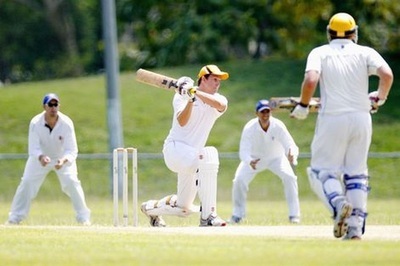 Haematoma (Cork): haematoma is one of the most common injuries in contact sports. A haematoma is a localised mass of blood within or around a muscle, derived from local blood vessels. The blood which forms the haematoma is usually clotted. The most common cause of a haematoma is direct blunt force impact. The haematoma is normally slowly re-absorbed by the body: massage, ultrasound, stretching and movement after the initial bleeding phase can help to speed this process. RICER management is important. Common symptoms: pain, stiffness, swelling and bruising (depending on haematoma type). 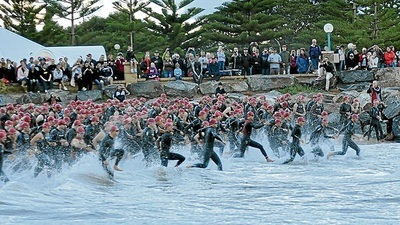 Risk factors: lack of protective equipment, contact sport involvement, mountain biking, surfing. Rotator Cuff Injury / Shoulder Impingement: damage to the rotator cuff tendon group, acromio-clavicular (AC) joint damage, sub-acromial bursitis, long head of biceps pathology, and capsular instability / labral damage can create pain around the shoulder and down the arm. The rotator cuff group is an important stabilising structure of the shoulder helping to keep the humeral head (ball) located centrally within the glenoid (socket). With cuff pathology often comes impingement pain. Common symptoms: pain around the shoulder and upper arm region when elevating the arm, pain sleeping on the shoulder, weakness with lifting, stiffness (loss of elevation / hand behind back movement). 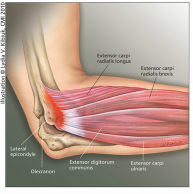 Tennis / Golfer's elbow: a condition affecting﻿ the outer (tennis) or inner (golfer's) part of the elbow due to chronic degeneration of the tendon/s attaching the forearm muscles to the humerus (arm bone). Common symptoms: pain and weakness with gripping: worse when the palm is facing downward, tenderness around the bony prominences of the inner / outer elbow. Carpal Tunnel Syndrome: a condition creating numbness, tingling and pain in the portion of the hand supplied by the median nerve due to compression of the nerve in the carpal tunnel of the wrist. Common symptoms: pain, numbness, tingling and / or burning in the thumb, 2nd, 3rd, and the inner half of the 4th finger. Risk factors: repetitive heavy gripping activities, obesity, diabetes, hypothyroidism, pregnancy, sustained flexed posturing of the wrist, vibration. De Quervain's Syndrome: a tenosynovitis (inflammation of the fluid-filled sheath surrounding the tendon) of two of the tendons controlling thumb movement (abductor pollicis longus and extensor pollicis brevis). Common symptoms: weakness of grip, pain over the thumb side of the wrist with gripping and movement involving the wrist / thumb. Risk factors: repetitive gripping, grasping, pushing, pulling, pinching (including typing / mouse-work), pregnancy, fluid retention. Hip Impingement / arthritis / labral tear: femoroacetabular impingement (FAI) is a condition which if not addressed early can lead to arthritis, and ultimately the need for a total hip replacement. 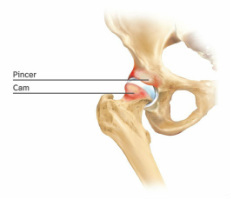 Damage to the labrum (the gasket of the hip joint) is often associated with FAI / arthritis. In this condition bony growth develops around the upper surface of the femoral head (ball), and the upper lip of the acetabulum (socket), most likely the body's protective response to repetitive trauma. ﻿Common symptoms:﻿ groin pain, with referral into the thigh / back, and a loss of range of movement. Groin pain (Adductor strain): there are a number of structures which can create groin pain. One of the more common acute causes is a strain to the adductor longus muscle. This is a common injury seen in sports requiring rapid acceleration and sudden changes in direction. Acute strain of this muscle results in sharp localised pain in the groin, worsened with kicking, running, twisting, and sudden sideways movement. Common symptoms: groin pain, limp, pain with walking, running, jumping, twisting and kicking. Risk factors: inflexibility, lack of pelvic stability, muscle imbalance, fatigue, lack of conditioning, decreased joint mobility. Knee ligament injuries (anterior / posterior cruciate, medial / lateral collateral ligament): ligaments are tough fibrous bands of tissue joining bone to bone, creating stability around a joint. There are 3 grades of injury, from a few collagen fibres torn (grade 1) through to complete rupture (grade 3). Ligament damage to the knee results from the knee adopting an awkward posture under load. Common symptoms: localised pain and rapid swelling (ACL/PCL) vs localised pain and minimal swelling (in grade 1 and 2 MCL/LCL injuries), weakness, instability / giving way, pain with end of range knee bending / straightening. Risk factors: valgus knee angle on landing, muscle imbalance: quads too strong compared to hamstrings, overtraining, poor body control, knee hypermobility, inappropriate playing surface, incorrect footwear. Meniscal Injuries: the menisci are the semi-lunar washers which supply cushioning and stability to the knee joint. These structures can be torn when the knee adopts an awkward posture (often involving pivoting), or can degenerate slowly over time. Common symptoms: pain and swelling around the knee joint, loss of movement, pain with pivoting, pain with squatting. Swelling can take up to 24 hours to develop following an acute meniscal tear. Risk factors: age, kneeling, squatting, stair climbing, prior ACL damage, involvement in sports requiring regular pivoting (such as soccer and rugby), inappropriate playing surface, incorrect footwear. Common symptoms: lateral knee ache / sharper pain, localised tenderness and swelling, walking peg-legged to alleviate pain, worsened with cycling / running / walking. Sometimes clicking is noted in the area. Risk factors: biomechanical flaws such as landing on the outer aspect of the foot during running, instability of the pelvis due to weakened gluteus medius and minimus, innapropriate footwear, running / walking on uneven ground / cambered surfaces, ITB tightness. Patellofemoral pain: is a syndrome characterised by pain or discomfort due to increased pressure between the patella (knee-cap) and the femur (thigh bone). The increased force can lead to thinning of the hyaline cartilage covering the bony surfaces of the femur and the patella (chondromalacia), and bony bruising. Common symptoms: localised knee pain noted with stair climbing / descending, kneeling, and prolonged sitting (with the knee flexed), grinding noise / sensation underneath the knee cap on movement. Risk factors: regular running and jumping, weak of hamstrings / quadriceps, increased thigh inward rotation on loading, lack of knee flexion, imbalance around the knee, poor arch support. Shin Splints (Medial Tibial Stress Syndrome): is a condition characterised by pain along the inner edge of the shin bone, commonly affecting athletes involved in running and jumping sports. 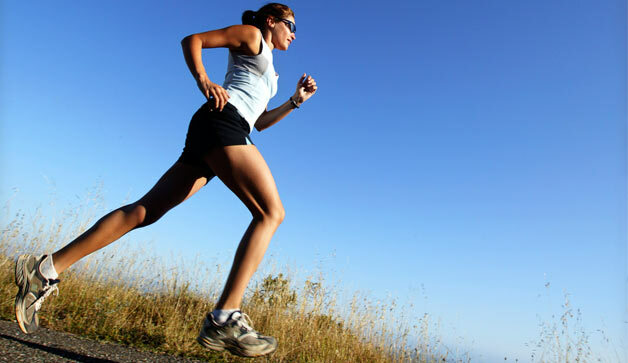 It accounts for 13-17% of running-related injuries. The pain is caused by disruption of Sharpey's fibres that connect the soleus (calf muscle) to the periosteum of the tibia (shin bone). This condition needs to be assessed carefully so as not to miss possible stress fractures, or to misdiagnose (Chronic Exertional Compartment Syndrome has a similar presentation). Common symptoms: tenderness to touch / soreness along the lower inner border of the shin bone, made worse with activity. Often worse in the morning. Risk factors: flat feet, hard / uneven training surfaces, poor footwear (poor arch support / inadequate cushioning), over-training, poor conditioning, inflexibility (lower limb), poor core-strength. 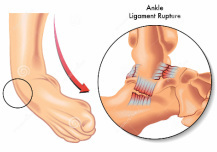 Ankle sprain: there are two types of ankle sprain- eversion sprain and the more common inversion sprain. Both involve the tearing of the ankle ligament/s. Common symptoms: localised pain, instability, swelling and bruising, pain on weight bearing, loss of movement. Risk factors: sudden explosive sideways movement (tennis, badminton, squash), poor flexibility, poor balance (proprioception), weak evertor muscles, uneven surfaces, inappropriate footwear. Achilles tendinitis: more accurately described as Achilles tendinosis / tendinopathy. This condition involves degeneration, and subsequent tearing of the tendon formed up by the soleus and gastrocnemius muscles which attach onto the calcaneum (heel bone) as the Achilles tendon. Common symptoms: ﻿localised﻿ pain, swelling / thickening around the Achilles tendon, inflexibility, pain with push-off phase of walking / running. Risk factors: tight calf, ankle stiffness, poor calf endurance, lack of arch support / poor footwear. Plantar Fasciitis: a painful disorder which affects the plantar fascia (a tough broad-banded ligament-like structure which attaches onto the undersurface of the heel and radiates to the bases of the toes). This condition which is due to repetitive overloading of the plantar fascia is initially inflammatory in nature, but progresses into a degenerative condition over time. Common symptoms: heel and arch pain with walking / prolonged standing, worse in the morning. Risk factors: limited first toe mobility, tightness in the calf, obesity, standing on hard surfaces for prolonged periods, excessive running, flat feet / high arches. Morton's neuralgia: also known as Morton's neuroma is a condition involving abnormal growth of nerve tissue (thickening) most commonly between the 2nd / 3rd and 3rd / 4th intermetatarsal spaces (between the metatarsal heads). Common symptoms: shooting pain / numbness / tingling / burning along the toes, feeling like you have a pebble in your shoe, worsening pain with standing / walking. Risk factors: tight footwear, poor arch support, a collapsed transverse arch, footwear with a lack of cushioning. Osgood Schlatter disease, Sever's disease, Sinding-Larsen-Johansson syndrome: this group of conditions are growth-plate related. The growth plate (epiphyseal plate) is the area of growing tissue near the ends of the long bones. When a person stops growing the growth plate closes. During growth spurts increased traction stress at the growth plate can lead to inflammation, pain, and thickening in the area. ﻿Common symptoms:﻿ pain on loading / stretching, tenderness to touch, worsening pain with activity, obvious limp, swelling at the site of pain. Joint Replacement Surgery (Hip, knee, ankle, shoulder): when a joint has suffered extensive arthritic change (complete loss of the cushioning hyaline cartilage), sometimes a joint replacement is required. This involves re-surfacing the joint linings with long-lasting synthetic materials (such as polyethelene, stainless steel, titanium, cobalt chromium, tantalum and / or zirconium). Physiotherapy following surgery is recommended so as to relieve pain and swelling, restore movement, regain strength, improve general conditioning, and improve balance (proprioception). Scoliosis / Kyphosis (Scheuermann's Disease): these conditions relate to abnormal curvature of the spine. Scoliosis is abnormal sideways curvature, and kyphosis is an abnormal forward curvature of the spine. The most common form of scoliosis is idiopathic. The cause is multi-factorial, and not completely understood. Depending on the degree of curvature treatment is hugely varied. Scoliosis is defined as a lateral curvature of the spine greater than 10 degrees accompanied by vertebral rotation. Scoliosis occurs most often during the growth spurt just before puberty (most common in girls aged 9-14). While scoliosis can be caused by conditions such as cerebral palsy, the cause of most scoliosis is unknown. Scoliosis is approximately 8 times more common in girls. If you are female and your mother has suffered from scoliosis you are 20 times more likely to suffer from scoliosis. About 1 in 10 to 1 in 20 girls develop a certain degree of scoliosis in early adolescence. Adolescent idiopathic scoliosis is present in 2 to 4 percent of children between 10 and 16 years of age. About 2% of girls have a curve which warrants medical observation. 3 girls per 1000 will require treatment during the growth phase. If treatment is required the earlier it is undertaken the better the long-term result. 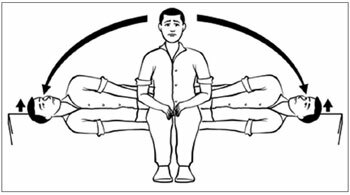 Adam’s Forward Bend Test: with the person leaning forward with straight knees, hands hanging down to the floor, look for a raised rib-cage on one side. A “rib hump” is a hallmark of scoliotic curves greater than 10 degrees. Standing up straight, with feet together and arms by side, look from behind for the spine being obviously curved, one shoulder / shoulder blade sitting higher than the other, one shoulder blade more prominent than the other (sticking out more), the head not centered over the body, uneven gaps between the arms and the trunk, or uneven hips (one hip sticking out more than the other). If a child appears to have a scoliosis an x-ray may be ordered to assess the angle of the curve (Cobb angle). Evaluation of growth potential is assessed using the Tanner scale (sexual maturity rating) and the Risser grading system (measuring the stage of skeletal growth). Tanner stages 2 to 3 occur just after the onset of the pubertal growth spurt and correlate to the time of maximum progression of scoliosis. Risser grade is directly correlated with the risk of curve progression. Children who have mild scoliosis are monitored closely, usually with X-rays, to see if the curve (Cobb angle) is getting worse. In many cases, no treatment is necessary. Some children with a curvature of 25 degrees or more (0.2%) may need to wear a brace to stop the curve from worsening. Others with a curve of 40 - 45 degrees or more may need surgery (0.1%) to keep the scoliosis from worsening and to straighten severe cases of scoliosis. If untreated severe scoliosis can cause long-term back pain and breathing difficulty. Contact us at Dunsborough Physiotherapy Centre if you require further advice, or want us to assess your child for scoliosis. We are able to refer for x-rays as appropriate to assess the degree of scoliosis. Remember: early detection is essential to lessen the need for more dramatic intervention (i.e. surgery). Arthritic pain: there are more than 100 types of arthritis. The two major types of arthritis are osteoarthritis ("wear and tear" arthritis), and rheumatoid arthritis (an inflammatory arthritis related to immune system overactivity). Osteoarthritis most commonly affects the weight-bearing joints (knees, hips, back, neck, big toe and fingers), while rheumatoid arthritis commonly affects fingers, wrists, toes feet and ankles (early stage) and elbows, shoulders and knees later. Rheumatoid arthritis is characterised by an hour or more of stiffness in the morning, and bilateral problems (left and right side affected). Common symptoms: pain, swelling and stiffness around the involved joints, worsened with activity. Risk factors: injury, obesity, lack of muscle conditioning, genetic factors. Vertigo: There are many causes of vertigo. Benign paroxysmal positional vertigo (BPPV) is a common form of vertigo which can be treated by physiotherapists using the Epley manoeuvre, Semont manoeuvre, Brandt-Darhoff exercises and the prescription a home exercise program. Common symptoms: inside your ear is a tiny organ called the vestibular labyrinth. It includes three loop-shaped structures (semicircular canals) that contain fluid and fine hair-like sensors that monitor the rotation of your head. Other structures (otolith organs) in your ear monitor movements of your head — up and down, right and left, back and forth — and your head's position related to gravity. These otolith organs — the utricle and saccule — contain crystals that make you sensitive to gravity. For a variety of reasons, these crystals can become dislodged. When they become dislodged, they can move into one of the semicircular canals — especially while you're lying down. This causes the semicircular canal to become sensitive to head position changes it would normally not respond to. As a result, you feel dizzy. Risk factors: when a cause can be determined (about 50% of the time), BPPV is often associated with a minor to severe blow to your head. Less common causes of BPPV include disorders that damage your inner ear or, rarely, damage that occurs during ear surgery or during prolonged positioning on your back. BPPV also has been associated with migraines. BPPV is more common with increasing age due to degeneration of the vestibular system.